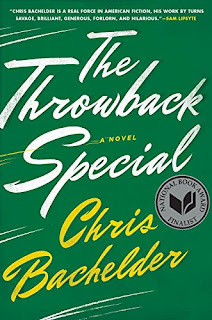 The Throwback Special by Chris Bachelder is a newer book (2017), that is a great fictional novel to enjoy in the heart of football season. The book has a somewhat unconventional premise, that almost like a symbolic plot element, works to create the scene more so that to be the essence of the story. The plot revolves around twenty-two men who gather annually to reenact the November 1985 play in Monday Night Football where in a match-up between the Washington Redskins matched up against the New York Giants and quarterback Joe Theismann has his leg broken by Lawrence Taylor in a trick play gone wrong. 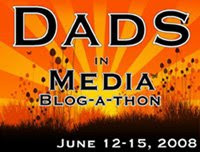 The story takes place over the weekend when these men gather and the story unfolds. While football plays a central thread to the story, the story is hardly about football. In fact, in many ways any man who has gathered with other men for any purposes (business or recreation), can probably relate to some part of this story. The story in many way, in my read, focuses on the inner psyche and interpersonal relationship among male acquaintances. In this regard, there is certainly something about this book that is a little existential, if not somewhat like a stand up comedy routine regarding male insecurity. The novel is very well written and a pleasure to read. 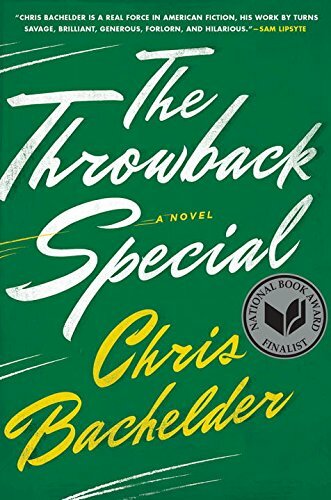 Bachelder's ridiculous premise and strangely unique insight and style has certainly sparked my interest here with this book. Not to mention, got me watching the clip of the 1985 Monday Night Football clip on YoutTube a number of times so I could capture and connect with the scene that these characters where trying to capture. This book is book number 8, in my 2017 goal to read 12 books in 2017. 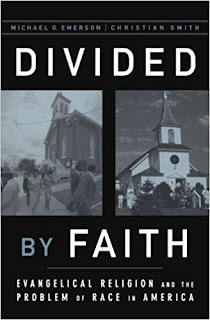 This past summer a friend posted on Facebook that she was starting a Facebook book reading group to read the book Divided By Faith: Evangelical Religion and the Problem of Race in America. I was instantly intrigued to get my hands on this book. It intrigued me because I was in part curious as to what this book would offer, acknowledging ahead of my reading that the church experience in American is rarely multi-cultural, and yet personally I would come up short on offering any true explanation. Race-issues in the United States continue to be a part of our national conversation, and although this book was published in 2000, I found it a relevant read. The book is somewhat out of my standard swim lane, for reading. If I read something in the social sciences, it usually is more in the realm of economics (although it's often applied economics, and there is an argument to be made that this is just sociology by another name). The book is a scholarly text written by Michael O. Emerson and Christian Smith, both university sociologist (at the time at Rice and University of North Carolina; currently at North Park University and Notre Dame). In the book Emerson and Smith introduce the topic by laying a historical ground work for the race divide in America and the role of the American church, specifically the evangelical sects of the American church. The 30 page second chapter of the book titled "From Separate pews to Separate churches: Evangelical Thought and Practice, 1700 - 1964" is probably worth the cover price alone. This chapter outlines a compelling outline of American history through the lens of the race and the church. From here the book breaks down the study that the professors performed and their results of many interviews across the United States. While this section of the book was in many ways one of the hardest parts to slog through, it also has in the past weeks of reading inspired the most conversation. Here the authors try to compartmentalize variations and differences in thoughts on race, as well as analyze the variations between white people against conservative protestant as well as strong and moderate evangelicals. The research is very compelling and it was interesting to hear how people discuss race, whether in conversations I've had with people while reading this book, or as people discuss (privately or publicly such as in radio interviews) recent news events, such as the Charleston, Virginia demonstrations this past summer which sparked an intense national conversation. The book is interesting in it's research and presentation to demonstrate how white evangelical Christians tend to have a different or religious based understanding of race, and as a result also a unique view on solutions namely one that is more based on inter personal relationships over structural change. From understanding the individual research, the researches further go on to discuss in it's conclusions also the role and sociological construct that leads towards homogeneous church bodies, and even the challenge of church leadership to speak out or breakdown these barriers within their congregations. I appreciate the book, and was happy to include it in my 12 books in 2017 challenge. Also, enjoyable was to be able to engage on some of these topics through the Facebook group that my friend created, where we could share some of the items we enjoyed as well as some of the items that challenged us. What is a frustrating challenge with this text is that the authors research in conclusion ends with more questions and challenges than solutions. There is no defined policy recommendation or individual charge or action to be taken. Instead the book exposes the complexity of this historical and modern challenge which faces America, and presents a unique layer to how an evangelical perspective creates a variation in views on this topic, solutions on this topic, and potentially impacts progress in the area of racial discrimination and reconciliation in American.